Human dirofilariasis typically manifests as either subcutaneous nodules or lung parenchymal disease, in many cases asymptomatically. 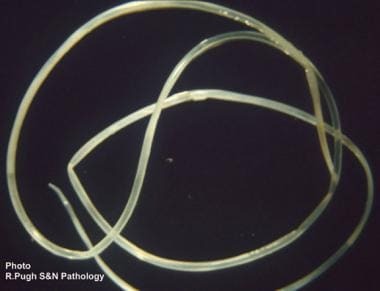 The zoonotic filariae of Dirofilaria immitis and Dirofilaria (Nochtiella) repens have become increasingly recognized worldwide as inadvertent human pathogens,  with the usual hosts of these infective nematodes being domestic and wild carnivores. In many cases, antifilarial medications are not administered prior to surgical resection of dirofilarial lesions. One group of authors, however, has recommended a single dose of ivermectin followed by 3 doses of diethylcarbamazine (DEC) if the syndrome is strongly suspected prior to surgery. Surgical excision of lesions and affected areas is the treatment of choice for dirofilariasis. Patients with subcutaneous dirofilarial lesions can usually be treated as outpatients or undergo day-case surgical procedures. 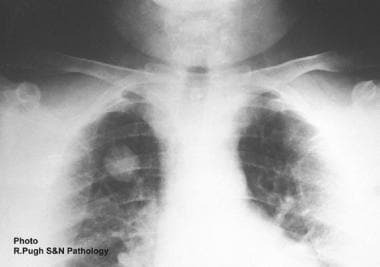 Plain chest radiographic appearance of pulmonary coin lesion secondary to Dirofilaria immitis infection in a man. Adult Dirofilaria immitis worm extracted from the heart and pulmonary artery of a dog. Worms usually are 1-3 mm in diameter, and females may grow to as long as 30 cm. In the dog, adult D immitis resides in the right ventricle and pulmonary arteries of the lung. Female worms produce and release thousands of microfilariae larvae into the circulation daily, which are ingested by mosquitoes in a blood meal. Larvae develop into infective larvae over the subsequent 10-16 days, depending on environmental conditions, before being reintroduced back into the dog. These larvae reside and mature in the subcutaneous tissues and along muscle sheaths for the next several months before migrating to the heart, where the nematode matures for 6-7 months. Adult worms are 1-3 mm in diameter, with females being 25-30 cm in length and males generally shorter. The adults of D repens, in contrast, reside in the subcutaneous tissues of dogs and cats, although the life cycle and release of microfilaria in the peripheral circulation remain the same as for D immitis. Human hosts are infected in the same way that the natural animal hosts are. Humans are accidental, dead-end hosts of dirofilariae, as the worms do not reach maturity in the heart or skin. Most infective larvae injected into humans are thought to perish; therefore, infected individuals are normally not microfilaremic. D immitis is most often associated with coin lesions of the lung (human pulmonary dirofilariasis, or HPD), but isolated reports exist of D immitis or D immitis –like worms causing cutaneous or conjunctival disease. Takayama et al described a rare case of cavity formation in pulmonary dirofilariasis in a Japanese woman infected with D immitis. A subcutaneous or subconjunctival lesion due to D immitis is also rare. D repens infection is the most frequent and widespread form of dirofilariasis in the world. The most common form is a subcutaneous or submucosal nodule. Ophthalmic involvement is also described, and the worm can be directly visualized in the bulbar conjunctiva. Breast nodules due to infection with D repens, which are observed in hyperendemic areas for the parasite, usually Italy and Sri Lanka, may be misdiagnosed as potential malignancies. Imported cases of D repens affecting the breast have been reported in the United States, Canada, Japan, and Australia, while pulmonary and abdominal lesions due to D repens infection have been reported in endemic areas of Italy, France, and Greece. Heartworm-associated respiratory disease results from the vascular and parenchymal inflammatory response associated with the arrival and death of Dimmitis worms into the distal pulmonary arteries. Some studies suggest the involvement of Wolbachia in the development of the inflammatory reaction and in the polarization of the host immune response against the parasite. This parasite harbors intracellular Wolbachia, an endosymbiont bacteria. Fourteen seropositive cats to Wolbachia and 8 seronegative cats were put into the plethysmograph chamber and different respiratory variables were measured. Significant differences were found for bronchoconstriction index (pause [PAU]), suggesting Wolbachia seems to produce a greater acute inflammatoryresponse at bronchial, vascular, and parenchymal levels, worsening the state of bronchoreactivity associated with the presence of seropositivity to D immitis. Dirofilariasis is a helmintic infection caused by parasites of the Dirofilaria genus (genus Dirofilaria, family Onchocercidae, which is included in the class of Nematodes). It is a common zoonotic disease affecting mostly dogs (lord hosts), other canines (wolves, coyotes), foxes, and cats. The Dirofilaria species that most commonly cause human infection are D immitis (heartworm) and D repens. It is transmitted to humans through arthropods; mosquitoes are the vector for Dirofilaria. Infection with these nematodes, however, is independent of dog ownership, although residence in or travel to an area where canine dirofilariasis is endemic is almost universal among cases of human dirofilariasis. Human disease caused by Dirofilaria species that infect other animals—including D tenuis (raccoon worm), D ursi (bear), D subdermata (porcupine), D lutrae (North American otter), D striata (wild American felines), and D spectans (Brazilian otter)—is occasionally reported in the medical literature. D tenuis has been described as a cause of subcutaneous facial nodules and ophthalmic dirofilariasis in Florida, while an adult female D striata was removed from the orbit of a 6-year-old boy living in North Carolina, and D spectans was extracted from a digital artery lesion of a Brazilian man. Initial theories suggested that the increased incidence of HPD found in elderly individuals (in contrast to the correspondingly low incidence of the condition in children) was the result of failing immunity. This theory has been disputed, however, as only 14% of adults diagnosed with HPD have a coexistent immune defect. The presence of D immitis infection is becoming increasingly recognized in North American wildlife (ie, coyotes, foxes, wolves, black bears) that share environments with humans. This may become increasingly relevant in the future control of dirofilariasis, because prophylactic antifilarials can be administered to domestic canines to eradicate and control Dirofilaria in urban areas. Two to 24 months after the release of captive red wolves, who had initially tested negative for microfilariae, into the Alligator River National Wildlife Refuge, in North Carolina, 14% of them tested positive for D immitis. Fifty-six percent of dingoes (Australian wild dogs, or Canis familiaris dingo) in a tropical region of Australia’s Northern Territory were found to be infected with adult D immitis worms. The urban prevalence of D immitis in red foxes in Australia ranges from 6.4% (Melbourne) to 8.8% (Sydney). In the Melbourne study, 2 known species of mosquito vector were also identified, increasing the risk of human infection. In Spain, 11% of red foxes in the Pyrenees region were found to be infected. The prevalence of dirofilariasis in domestic dogs and cats varies by state and geographic region throughout the United States. All states except Nevada have reported D immitis infection in dogs, with the prevalence varying from low levels in some states (0.3%, 0.5%, and 1.2% in Colorado, Washington, and Montana, respectively) to as high as 40% in Florida and South Carolina. Of stray cats in Michigan, 3% were found to have adult D immitis worms at autopsy. In general, the infection is more prevalent in dogs than in cats, in which prophylaxis is not routinely recommended. The rate of dirofilariasis in dogs in Sri Lanka, another area endemic for D repens, is high, with rates of 30-60%. The epidemiology of human dirofilariasis is related to the prevalence of canine dirofilariasis, the presence of suitable mosquito vectors, and human activities that lead to exposure. D immitis causes most cases human dirofilariasis in the United States, with the prevalence of canine dirofilariasis having increased since the late 20th century. The geographic spread of the human disease has paralleled that of the dog population, although human dirofilariasis tends to be independent of dog ownership. Most HPD cases have been found in the states adjacent to the Gulf of Mexico and the southern Atlantic states, where the prevalence of canine D immitis infection has been documented to be as high as 40%. The entire range of canine D immitis infection extends much further, however, existing along the Mississippi River Valley and into southern Canada. Canine dirofilariasis has been described in all of the lower 48 states except Nevada. The first human case of dirofilariasis in the United States was described in a female cadaver in New Orleans in 1941. The first description of HPD causing pulmonary infarction was in 1961. Since then, at least 197 cases of HPD, presumably caused by D immitis, have been reported. Ten cases of D ursi infection, 3 cases of D tenuis subcutaneous infection, and isolated cases of D striata and possible D lutrae infection have also been reported. The most commonly reported manifestation of human dirofilariasis worldwide is subcutaneous or ocular disease caused by D repens, with 800 case reports in the medical literature. D repens is an Old World parasite and has not been described in the Americas, Japan, or Australia. The incidence of ocular dirofilariasis is on the rise in several parts of India, particularly in Kerala. Human exposure to D immitis larvae has also been reported in isolated communities of Colombian Indian tribes of the Amazon rainforest. Overall, the volume of reported cases of dirofilariasis and the number of affected countries have been on the increase. In addition to the aforementioned climate changes, several other factors may be responsible for the increase, including greater medical awareness in more countries. Another factor may be increased travel to endemic countries; most described cases of dirofilariasis in central and northern Europe have been attributed to travel to endemic zones of southern Europe or the United States. According to some suggestions, the true prevalence of human exposure to and disease caused by D immitis is underestimated, because canine infection is widespread throughout the world and most infected people are asymptomatic. A seroprevalence study in Spain, where 33% of dogs are infected with D immitis,  revealed that 22% of humans were seropositive (immunoglobulin G [IgG], 5.8%; IgM, 3.5%; IgE, 12.6%). [58, 59] IgG seroconversion was most prevalent in people older than 60 years, whereas IgM seropositivity was most common in persons younger than 19 years. The level of IgE was also found to decrease with age. The authors concluded that repeated contact with D immitis in this endemic population was common and began at an early age. All studies of HPD from the United States have reported a predominance of infection in people of European descent (as high as 95%). This probably indicates a selection bias, with more white Americans presenting for radiologic screening investigations than African Americans. In general, following diagnosis and resection of the affected tissue, the prognosis for patients with dirofilariasis is excellent. Complications with dirofilariasis are rare. The most common ones are nonspecific respiratory symptoms or a small pulmonary infarct that brings the infection to medical attention. Intraocular, subconjunctival, and retro-orbital  infections have also been reported. [62, 63, 64] A single case report describes meningoencephalitis and aphasia complicating infection with D repens. No recorded fatalities due directly to dirofilariasis have been reported in the medical literature. The primary clinical significance of HPD is the almost invariable radiologic misdiagnosis of a primary or metastatic lung tumor, which usually leads to thoracotomy with open lung biopsy or wedge resection of the lung to obtain the correct diagnosis. Simón F, Siles-Lucas M, Morchón R, González-Miguel J, Mellado I, Carretón E, et al. Human and animal dirofilariasis: the emergence of a zoonotic mosaic. Clin Microbiol Rev. 2012 Jul. 25(3):507-44. [Medline]. [Full Text]. Font RL, Neafie RC, Perry HD. Subcutaneous dirofilariasis of the eyelid and ocular adnexa. Report of six cases. Arch Ophthalmol. 1980 Jun. 98(6):1079-82. [Medline]. Joseph K, Vinayakumar AR, Criton S, Vishnu MS, Pariyaram SE. Periorbital mass with cellulitis caused by dirofilaria. Indian J Med Microbiol. 2011. 29 (4):431-3. [Medline]. [Full Text]. Mittal M, Sathish KR, Bhatia PG, Chidamber BS. Ocular dirofilariasis in Dubai, UAE. Indian J Ophthalmol. 2008 Jul-Aug. 56(4):325-6. [Medline]. [Full Text]. Sathyan P, Manikandan P, Bhaskar M, Padma S, Singh G, Appalaraju B. Subtenons infection by Dirofilaria repens. Indian J Med Microbiol. 2006 Jan. 24(1):61-2. [Medline]. Korkhov AP, Temirov NE, Nagornyi SA, et al. [A case of the rare intraocular site of Dirofilaria spp. in man]. Med Parazitol (Mosk). 2009 Jan-Mar. 59. [Medline]. Tse BC, Siatkowski R, Tse DT. A technique for capturing migratory periocular worms: a case series and review of literature. Ophthal Plast Reconstr Surg. 2010 Sep-Oct. 26(5):323-6. [Medline]. Dorland’s Illustrated Medical Dictionary. 32nd ed. Philadelphia: Elsevier Saunders; 2012. Cancrini G, Pietrobelli M, Frangipane di Regalbono AF, Tampieri MP, della Torre A. Development of Dirofilaria and Setaria nematodes in Aedes albopictus. Parassitologia. 1995 Dec. 37(2-3):141-5. [Medline]. Nozais JP, Bain O, Gentilini M. [A case of subcutaneous dirofilaria (Nochtiella) repens with microfilaremia originating in Corsica]. Bull Soc Pathol Exot. 1994. 87(3):183-5. [Medline]. Capelli G, Frangipane di Regalbono A, Simonato G, Cassini R, Cazzin S, Cancrini G, et al. Risk of canine and human exposure to Dirofilaria immitis infected mosquitoes in endemic areas of Italy. Parasit Vectors. 2013 Mar 7. 6:60. [Medline]. [Full Text]. Kim MK, Kim CH, Yeom BW, Park SH, Choi SY, Choi JS. The first human case of hepatic dirofilariasis. J Korean Med Sci. 2002 Oct. 17(5):686-90. [Medline]. Dobson C, Welch JS. Dirofilariasis as a cause of eosinophilic meningitis in man diagnosed by immunofluorescence and Arthus hypersensitivity. Trans R Soc Trop Med Hyg. 1974. 68(3):223-8. [Medline]. Moorhouse DE. Dirofilaria immitis: a cause of human intra-ocular infection. Infection. 1978. 6(4):192-3. [Medline]. Tada I, Sakaguchi Y, Eto K. Dirofilaria in the abdominal cavity of a man in Japan. Am J Trop Med Hyg. 1979 Nov. 28(6):988-90. [Medline]. Theis JH, Gilson A, Simon GE, Bradshaw B, Clark D. Case report: Unusual location of Dirofilaria immitis in a 28-year-old man necessitates orchiectomy. Am J Trop Med Hyg. 2001 May-Jun. 64(5-6):317-22. [Medline]. Morchon R, Rodriguez-Barbero A, Velasco S, Lopez-Belmonte J, Simon F. Vascular endothelial cell activation by adult Dirofilaria immitis antigens. Parasitol Int. Dec 2008. 57(4):441-6. [Medline]. Faust EC, Thomas ER, Jones J. Discovery of human heartworm infection in New Orleans. J Parasitol. 1941. 27:115-22. Takeuchi T, Asami K, Kobayashi S, et al. Dirofilaria immitis infection in man: report of a case of the infection in heart and inferior vena cava from Japan. Am J Trop Med Hyg. 1981 Sep. 30(5):966-9. [Medline]. Takayama Y, Nakamur Y, Hamai K, et al. [Case of pulmonary dirofilariasis with cavity formation in a young woman]. Nihon Kokyuki Gakkai Zasshi. 2009 May. 47(5):372-5. [Medline]. Abdel-Rahman SM, Mahmoud AE, Galal LA, Gustinelli A, Pampiglione S. Three new cases of human infection with Dirofilaria repens, one pulmonary and two subcutaneous, in the Egyptian governorate of Assiut. Ann Trop Med Parasitol. 2008 Sep. 102(6):499-507. [Medline]. Grandi G, Morchon R, Kramer L, Kartashev V, Simon F. Wolbachia in Dirofilaria repens, an agent causing human subcutaneous dirofilariasis. J Parasitol. December 2008. 94(6):1421-3. [Medline]. Kramer L, Grandi G, Leoni M, et al. Wolbachia and its influence on the pathology and immunology of Dirofilaria immitis infection. Vet Parasitol. 2008 Dec 10. 158(3):191-5. [Medline]. García-Guasch L, Caro-Vadillo A, Manubens-Grau J, et al. Is Wolbachia participating in the bronchial reactivity of cats with heartworm associated respiratory disease?. Vet Parasitol. 2013 Feb 9. [Medline]. Marcos-Atxutegi C, Kramer LH, Fernandez I, et al. Th1 response in BALB/c mice immunized with Dirofilaria immitis soluble antigens: a possible role for Wolbachia?. Vet Parasitol. 2003 Feb 28. 112(1-2):117-30. [Medline]. Morchon R, Lopez-Belmonte J, Bazzocchi C, Grandi G, Kramer L, Simon F. Dogs with patent Dirofilaria immitis infection have higher expression of circulating IL-4, IL-10 and iNOS mRNA than those with occult infection. Vet Immunol Immunopathol. 2007 Jan 15. 115(1-2):184-8. [Medline]. Pou-Barreto C, Quispe-Ricalde MA, Morchon R, et al. Galectin and aldolase-like molecules are responsible for the specific IgE response in humans exposed to Dirofilaria immitis. Parasite Immunol. 2008 Nov-Dec. 30(11-12):596-602. [Medline]. Simon F, Lopez-Belmonte J, Marcos-Atxutegi C, Morchon R, Martin-Pacho JR. What is happening outside North America regarding human dirofilariasis?. Vet Parasitol. 2005 Oct 24. 133(2-3):181-9. [Medline]. Wixsom MJ, Green SP, Corwin RM, Fritzell EK. Dirofilaria immitis in coyotes and foxes in Missouri. J Wildl Dis. 1991 Jan. 27(1):166-9. [Medline]. Holzman S, Conroy MJ, Davidson WR. Diseases, parasites and survival of coyotes in south-central Georgia. J Wildl Dis. 1992 Oct. 28(4):572-80. [Medline]. Sacks BN. Increasing prevalence of canine heartworm in coyotes from California. J Wildl Dis. 1998 Apr. 34(2):386-9. [Medline]. Davidson WR, Appel MJ, Doster GL, Baker OE, Brown JF. Diseases and parasites of red foxes, gray foxes, and coyotes from commercial sources selling to fox-chasing enclosures. J Wildl Dis. 1992 Oct. 28(4):581-9. [Medline]. Marks CA, Bloomfield TE. Canine heartworm (Dirofilaria immitis) detected in red foxes (Vulpes vulpes) in urban Melbourne. Vet Parasitol. 1998 Jul 31. 78(2):147-54. [Medline]. Pung OJ, Davis PH, Richardson DJ. Filariae of raccoons from southeast Georgia. J Parasitol. 1996 Oct. 82(5):849-51. [Medline]. Duffy MS, Greaves TA, Burt MD. Helminths of the black bear, Ursus americanus, in New Brunswick. J Parasitol. 1994 Jun. 80(3):478-80. [Medline]. Roncalli RA, Yamane Y, Nagata T. Prevalence of Dirofilaria immitis in cats in Japan. Vet Parasitol. 1998 Feb 15. 75(1):81-9. [Medline]. Bidgood A, Collins GH. The prevalence of Dirofilaria immitis in dogs in Sydney. Aust Vet J. 1996 Mar. 73(3):103-4. [Medline]. Copland MD, O'Callaghan MG, Hajduk P, O'Donoghue PJ. The occurrence of Dirofilaria immitis in dogs in South Australia. Aust Vet J. 1992 Feb. 69(2):31-2. [Medline]. Kendall K, Collins GH, Pope SE. Dirofilaria immitis in cats from inner Sydney. Aust Vet J. 1991 Nov. 68(11):356-7. [Medline]. Alves LC, de Almeida Silva LV, Faustino MA, McCall JW, Supakonderj P, Labarthe NW, et al. Survey of canine heartworm in the city of Recife, Pernambuco, Brazil. Mem Inst Oswaldo Cruz. 1999 Sep-Oct. 94(5):587-90. [Medline]. Genchi C, Rinaldi L, Mortarino M, Genchi M, Cringoli G. Climate and Dirofilaria infection in Europe. Vet Parasitol. 2009 Aug 26. 163(4):286-92. [Medline]. Perret-Court A, Coulibali B, Ranque S, Bouvier C, Lena G, Coze C, et al. Intradural dirofilariasis mimicking a Langerhans cell histiocytosis tumor. Pediatr Blood Cancer. September 2009. 53(3):485-7. [Medline]. Raccurt CP. [Human dirofilariasis in France: new data confirming the human transmission of Dirofilaria repens to the north of the 46 degree north latitude]. Med Trop (Mars). 2000. 60(3):308-9. [Medline]. Petrić D, Zgomba M, Bellini R, Becker N. Surveillance of Mosquito Populations: A Key Element to Understanding the Spread of Invasive Vector Species and Vector-Borne Diseases in Europe. Mihailović D, ed. Essays on Fundamental and Applied Environmental Topics. Hauppauge, NY: Nova Science Publishers; 2012. 192-224. Genchi C, Kramer LH, Rivasi F. Dirofilarial infections in Europe. Vector Borne Zoonotic Dis. 2011 Oct;. 11(10):1307-17. [Medline]. Genchi C, Rinaldi L, Cascone C, Mortarino M, Cringoli G. Is heartworm disease really spreading in Europe?. Vet Parasitol. 2005 Oct. 133(2-3):137-48. [Medline]. Morchón R, Carretón E, González-Miguel J, Mellado-Hernández I. Heartworm Disease (Dirofilaria immitis) and Their Vectors in Europe - New Distribution Trends. Front Physiol. 2012. 3:196. [Medline]. [Full Text]. Sassnau R, Genchi C. Qualitative risk assessment for the endemisation of Dirofilaria repens in the state of Brandenburg (Germany) based on temperature-dependent vector competence. Parasitol Res. 2013 Apr 23. [Medline]. Szenasi Z, Kovacs AH, Pampiglione S, et al. Human dirofilariosis in Hungary: an emerging zoonosis in central Europe. Wien Klin Wochenschr. 2008. 120(3-4):96-102. [Medline]. Kramer LH, Kartashev VV, Grandi G, et al. Human subcutaneous dirofilariasis, Russia. Emerg Infect Dis. 2007 Jan. 13(1):150-2. [Medline]. [Full Text]. Darchenkova NN, Supriaga V G, Guzeeva MV, Morozov EN, Zhukova LA, Sergiev VP. [Prevalence of human dirofilariasis in Russia]. Med Parazitol (Mosk). 2009 Apr-Jun. 3-7. [Medline]. Kartashev V, Tverdokhlebova T, Korzan A, Vedenkov A, Simón L, González-Miguel J, et al. Human subcutaneous/ocular dirofilariasis in the Russian Federation and Belarus, 1997-2013. Int J Infect Dis. 2015 Apr. 33:209-11. [Medline]. Babal P, Kobzova D, Novak I, Dubinsky P, Jalili N. First case of cutaneous human dirofilariosis in Slovak Republic. Bratisl Lek Listy. 2008. 109(11):486-8. [Medline]. Bezic J. Human dirofiliariasis in Croatia. Acta Dermatovenerol Croat. 2009. 17(1):82-3. [Medline]. Dissanaike AS, Abeyewickreme W, Wijesundera MD, Weerasooriya MV, Ismail MM. Human dirofilariasis caused by Dirofilaria (Nochtiella) repens in Sri Lanka. Parassitologia. 1997 Dec. 39(4):375-82. [Medline]. Badhe BP, Sane SY. Human pulmonary dirofilariasis in India: a case report. J Trop Med Hyg. 1989 Dec. 92(6):425-6. [Medline]. Perez-Sanchez R, Gomez-Bautista M, Grandes AE. Canine filariasis in Salamanca (northwest Spain). Ann Trop Med Parasitol. 1989 Apr. 83(2):143-50. [Medline]. Simón F, Muro A, Cordero M, Martin J. A seroepidemiologic survey of human dirofilariosis in Western Spain. Trop Med Parasitol. 1991 Jun. 42(2):106-8. [Medline]. Miró G, Montoya A, Roura X, Gálvez R, Sainz A. Seropositivity rates for agents of canine vector-borne diseases in Spain: a multicentre study. Parasit Vectors. 2013 Apr 22. 6:117. [Medline]. [Full Text]. Kokta V. Zoonotic deep cutaneous filariasis--three pediatric cases from Québec, Canada. Pediatr Dermatol. 2008. 25 (2):230-232. [Medline]. Ilyasov B, Kartashev V, Bastrikov N, Morchón R, González-Miguel J, Simón F. Delayed diagnosis of Dirofilariasis and complex ocular surgery, Russia. Emerg Infect Dis. 2013 Feb. 19(2):326-8. [Medline]. [Full Text]. Otranto D, Brianti E, Gaglio G, Dantas-Torres F, Azzaro S, Giannetto S. Human ocular infection with Dirofilaria repens (Railliet and Henry, 1911) in an area endemic for canine dirofilariasis. Am J Trop Med Hyg. 2011 Jun. 84(6):1002-4. [Medline]. [Full Text]. Otranto D, Diniz DG, Dantas-Torres F, Casiraghi M, de Almeida IN, de Almeida LN, et al. Human intraocular filariasis caused by Dirofilaria sp. nematode, Brazil. Emerg Infect Dis. 2011 May. 17(5):863-6. [Medline]. [Full Text]. Avellis FO, Kramer LH, Mora P, Bartolino A, Benedetti P, Rivasi F. A case of human conjunctival dirofilariosis by Dirofilaria immitis in Italy. Vector Borne Zoonotic Dis. 2011 Apr. 11(4):451-2. [Medline]. Poppert S, Hodapp M, Krueger A, Hegasy G, Niesen WD, Kern WV, et al. Dirofilaria repens infection and concomitant meningoencephalitis. Emerg Infect Dis. 2009 Nov. 15(11):1844-6. [Medline]. [Full Text]. Nath R, Gogoi R, Bordoloi N, Gogoi T. Ocular dirofilariasis. Indian J Pathol Microbiol. 2010 Jan-Mar. 53(1):157-9. [Medline]. Kalogeropoulos CD, Stefaniotou MI, Gorgoli KE, Papadopoulou CV, Pappa CN, Paschidis CA. Ocular dirofilariasis: a case series of 8 patients. Middle East Afr J Ophthalmol. 2014 Oct-Dec. 21(4):312-6. [Medline]. [Full Text]. Revesz E, Markovics G, Darabos Z, Toth I, Fok E. [Dirofilaria in the abdominal cavity]. Magy Seb. 2008 Oct. 61(5):281-4. [Medline]. Theis JH. Public health aspects of dirofilariasis in the United States. Vet Parasitol. 2005 Oct 24. 133(2-3):157-80. [Medline]. Latrofa MS, Dantas-Torres F, Annoscia G, Genchi M, Traversa D, Otranto D. A duplex real-time polymerase chain reaction assay for the detection of and differentiation between Dirofilaria immitis and Dirofilaria repens in dogs and mosquitoes. Vet Parasitol. 2012 Apr 30. 185(2-4):181-5. [Medline]. Latrofa MS, Weigl S, Dantas-Torres F, Annoscia G, Traversa D, Brianti E, et al. A multiplex PCR for the simultaneous detection of species of filarioids infesting dogs. Acta Trop. 2012 Apr. 122(1):150-4. [Medline]. Rivasi F, Boldorini R, Criante P, Leutner M, Pampiglione S. Detection of Dirofilaria (Nochtiella) repens DNA by polymerase chain reaction in embedded paraffin tissues from two human pulmonary locations. APMIS. 2006 Jul-Aug. 114(7-8):567-74. [Medline]. Miyoshi T, Tsubouchi H, Iwasaki A, Shiraishi T, Nabeshima K, Shirakusa T. Human pulmonary dirofilariasis: a case report and review of the recent Japanese literature. Respirology. 2006 May. 11(3):343-7. [Medline]. Magono N, Yosimatu H, Suzuki Y, et al. [A case of pulmonary dirofilariasis diagnosed by biopsy, immunological tests and the clinical course without operation]. Nihon Kokyuki Gakkai Zasshi. 2009 Jun. 47(6):467-70. [Medline]. Roussel F, Delaville A, Campos H, Benozio M, Brasseur P. Fine needle aspiration of retroperitoneal human dirofilariasis with a pseudotumoral presentation. Acta Cytol. 1990 Jul-Aug. 34(4):533-5. [Medline]. Pampiglione S, Rivasi F, Gustinelli A. Dirofilarial human cases in the Old World, attributed to Dirofilaria immitis: a critical analysis. Histopathology. 2009 Jan. 54(2):192-204. [Medline]. Marusic Z, Stastny T, Kirac I, Stojcevic D, Kruslin B, Tomas D. Subcutaneous dirofilariasis caused by Dirofilaria repens diagnosed by histopathologic and polymerase chain reaction analysis. Acta Dermatovenerol Croat. 2008. 16(4):222-5. [Medline]. Bazzocchi C, Mortarino M, Grandi G, et al. Combined ivermectin and doxycycline treatment has microfilaricidal and adulticidal activity against Dirofilaria immitis in experimentally infected dogs. Int J Parasitol. 2008 Oct. 38(12):1401-10. [Medline]. Giannelli A, Ramos RA, Traversa D, et al. Treatment of Dirofilaria repens microfilariaemia with a combination of doxycycline hyclate and ivermectin. Vet Parasitol. 2013 May 21. [Medline]. Yaranal PJ, Priyadarshini MM, Purushotham B. Human subcutaneous dirofilariasis of forearm an unusual presentation. Indian J Dermatol. 2015 Jan-Feb. 60(1):103. [Medline]. [Full Text]. Transverse section through an immature adult Dirofilaria immitis removed from the right chest wall of an 18-month-old child in Sydney, Australia. The large lateral chords and multilayered cuticle are typical of Dirofilaria. The smooth cuticle is a feature of D immitis. Transverse section through a mature female Dirofilaria repens removed from the superomedial orbital rim of a 67-year-old man. The patient was infected in Corfu, Greece, 6 months prior to diagnosis in Sydney, Australia. Features characteristic of Dirofilaria are the arrangement of the longitudinal muscles and the multilayered cuticle, which is expanded in the region of the large lateral chords. Higher-magnification image of the Dirofilaria repens displayed in the previous image. The nematode was removed from the eye of a 67-year-old man. The features characteristic of D repens are the longitudinal ridges on the cuticle; the ridges are 6-7 micrometers wide, spaced at 11- to 12-micrometer intervals. Low-power view of a bulbar conjunctival biopsy specimen obtained from a 72-year-old man from Queensland, Australia, showing degenerate pieces of an immature Dirofilaria immitis worm in cross-sections and longitudinal sections with Masson stain. Midpower view of bulbar conjunctival biopsy specimen showing degenerate pieces of an immature Dirofilaria immitis worm in cross-section and longitudinal section view with Masson stain. High-power view of bulbar conjunctival biopsy specimen showing a cross-section of immature Dirofilaria immitis. The thin, smooth cuticle with internal, lateral, longitudinal ridges; the thin hypodermis; the large lateral cords; the well-developed coelomyarial muscles; and the ill-defined reproductive organs are diagnostic of an immature D immitis (hematoxylin and eosin stain).